I had a suddenly aborted Saturday evening plan. I was stuck roaming the city a bit, so I decided to go to the new mega-HEB on Bunker Hill and I-10. This massive super-supermarket has been written about before, but color me impressed. Best prices I have seen for clementine oranges, now in season. There's the cheese decorating counter - think cake decorating, except for wheels of brie. But I had to partake of the thing that I haven't seen in any other store in Houston before: on demand, freshly ground, whole wheat flour. With choice of getting soft wheat or hard winter wheat, natch. Goodness gracious, I can't wait to bake with the stuff. Over the salad dressing aisle is a wooden locked case of balsamico tradizionale. Complete with $150 a bottle price tags. My heart skipped a beat. It went downhill from there, I ended up buying more things than I planned (since when was there such a preponderance of eggs gathered from free roaming chickens - with a fairly minor premium on the price? Either the prices of factory farmed eggs have gone up, or someone has figured out a way to machine gather those eggs.). No luck with kettle corn, though. 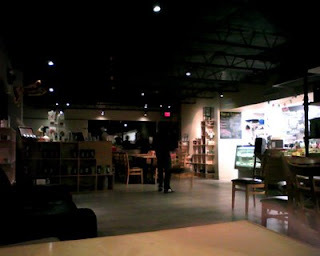 To recuperate, I am having a snack and a chai at Te House of Tea. Food and WiFi, what could be better? Apparently, tonight is swing dancing night, could be interesting. Here's the dance floor, as they cleared out the tables for people. I would bet they changed the definition of free-range chicken. I know that in the late 90s, the definition of free-range turkey was that it had been able to go outside at least once during its life. Not that it *had* gone outside, but that it could have if it wanted to. Swing dancing, eh? A good lead - that's a hobby for Jaime and me. The swing dancing seems pretty decent. Starts around 9pm, and looks like fun. This is utterfly fascinating (and makes me want duck eggs for myself!). mmmmm. I can't wait to shop at the new HEB, too! I so wish we had even a "good" HEB over here in the Heights. I spend a lot of time in Austin and love shopping those HEB's. I don't know if they are "free range" but there are some great fresh eggs brought by a couple of vendors at the Midtown Farmer's Market on Saturday mornings and used to be some great ones at the Heights Farmer's Market (on White Oak in the Onion Creek Parking lot) though I haven't been to that one in awhile. I've seen them at Wabash on Washington, too but not sure of any details as far as the chickens. The drive from the Heights to Longpoint isn't that bad. Plus, take the time to explore the Korean markets while you're at it. By the way, I bought both duck and chicken eggs from the Bayou City Farmer's Market. I LOVE the new HEB Bunker Hill. I live in the Heights, but the store is on my way home from work so I've been going about once/week. I hadn't seen the fresh whole wheat flour, will have to check it out. I got 1/2 lb of the sundried tomato/pesto brie a couple weeks ago to take to a friends house for dinner. It was excellent and the colors were green and red so perfect for Christmas.